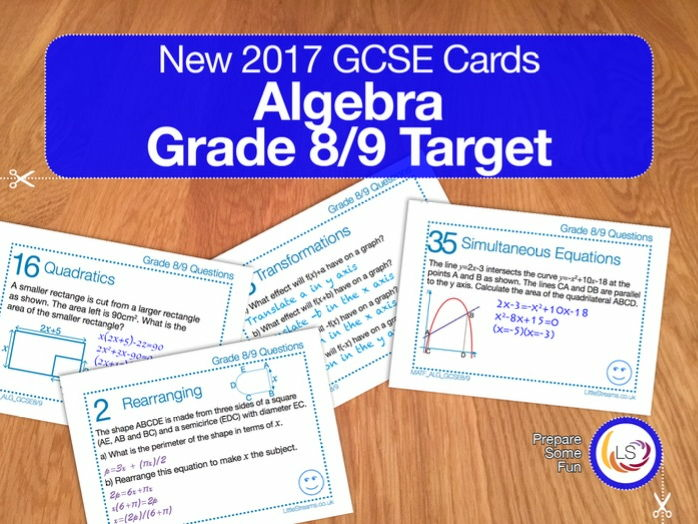 This pack contains 48 exam style question cards covering the new curriculum for the top grades of the new gcse in algebra. The design of a card means you can use these in a variety of ways in your classroom; as a starter or a plenary, as extension work, as homework or as a revision tool. An answer key is included. The questions feature some challenging topics including rearranging fractional equations, expanding more than one brackets, manipulating and solving algebraic fractions with both addition and division, algebraic proofs that include some well known theories, as well as some rewriting of equation questions, factorising, completing the square and solving of quadratic equations and inequalities where the coefficient of x^2 is greater than one, as well as where the question is set up through scenarios, finding the nth term of quadratic sequences and working with the Fibonacci sequence, working with quadratic simultaneous equations, composite and inverse functions, and a variety of graph transformation questions. Changed Q38 completely after recent GCSE to be better suited. Previous purchasers download again for latest version. 3 version of this are included full version, condensed version with out space for answers to save on photocopying, condensed version with out links to answers. The GCSE maths is divided in to five different topics, there will be a different number of questions (or parts of questions) depending on the topic. The different number of questions in each section in this book reflects the exam. This book is not designed as a text book or revision guide, but as a workbook. There are lots of good (and bad) expensive and free revision guides out there, on my YouTube channel and other great websites. So, there is no point in me adding to the masses. All the teaching, all the new content and fully worked answers, is available for free on my YouTube channel, this book is for you to practice and learn. The best way to approach this is to watch the teaching video and make notes, or after class try a section and check the answers. A pack of 5 Revision sheets/tests for the new Higher GCSE 9-1. This pack is aimed at those targeting the higher grades 8/9. Each one contains 20 different questions based on the specifications for the new GCSE, all fitted onto one double sided A4 sheet. Great for keeping photocopying down whilst practicing loads of exam style questions! Topics covered include those new to the Higher curriculum, and are aimed at students targeting grade 8/9. Worked Solutions are also included. There is a record sheet (which can be used as a revision list) for each pupil to record their score after each attempt and try to beat it the next time! Each worksheet has similar questions & key skills but with new examples each time in order for students to build confidence, fluency, and consolidate their learning. Exam questions on direct and indirect proportion compiled into a double sided worksheet to help with the photocopying crunch! We used these as homework for Year 11 covering a half term. New topic Masters aim to get higher paper pupils familiar with some of the new topics and new style of questioning on the new GCSE. Higher/Foundation Masters are aimed at all students to become more confident in some of the cross over topics. Foundation Masters aimed at foundation paper pupils to gain more confidence in number work and money problems. I found that it worked best printed on one A4 sheet for students to stick at the back of their books and leave a page for their workings. The tracker is useful for pupils and teachers to track progress. Created for students sitting AQA specification in 2017. Here is a "mind map" of all of the gcse topics students need to know for the GCSE maths exam. There is a foundation and higher version. Ideal revision for GCSE Foundation Maths, these worksheets require students to complete five questions each day (Monday to Saturday). Topics covered include fractions, decimals, percentages, factors, multiples, negative numbers, rounding, powers and ratio. You will receive an TWO excel spreadsheets that will randomly generate a set of questions for you to print, differentiated by GCSE grade (2/3 and 4). Please take a look at the video below (or use link https://youtu.be/vTJgJhxnh4I) to see how to generate new questions. Also included are examples of the worksheets generated from this file. To print worksheets: In print options, set the margins to narrow and select the entire workbook to print. A set of worksheets covering all of the required Venn Diagrams topic for the new GCSE 9-1 Maths syllabus. These worksheets match perfectly with our interactive teaching tools at MathsPad. The first one is free and can be found at www.MathsPad.co.uk. There are 20 set of 9 questions, one a lesson in the build up to the exams, with a mixture of every topic in the new GCSE 1-9 higher exam. Perfect for revision as every topic is covered multiple times. I have also included 18 investigation style exam questions at the back. A revision activity in the style of a pub quiz, ideal for an end of term lesson. The quiz can be displayed on the board and consists of four different rounds, covering a variety of topics aimed at grades 4-5. We've included a printable answer sheet for students, as well as full instructions and solutions. 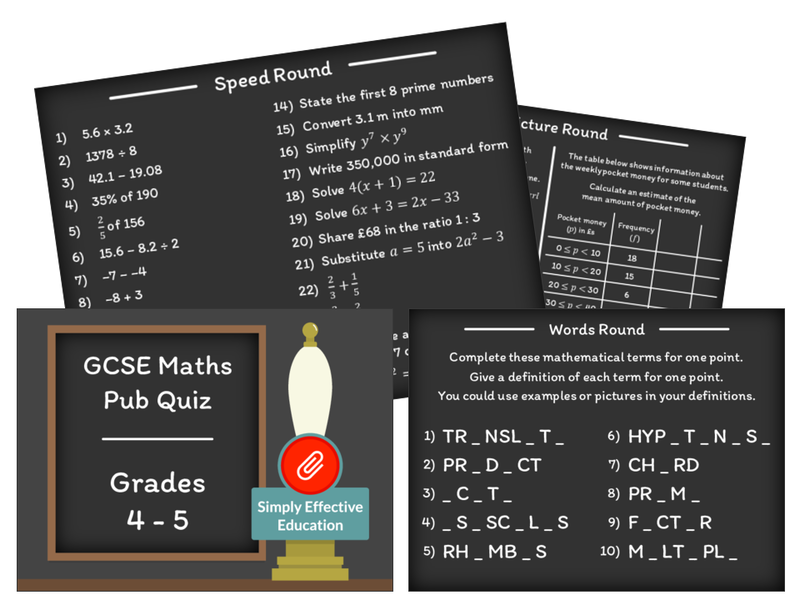 Get our GCSE Maths Pub Quiz for grades 1-3! Get our GCSE Maths Pub Quiz for grades 6-9! In these GCSE worksheets there are two revision races, aimed at different grades. The teams start with the picture and the first question. When they have shown the answer they are given the next question and so on. I wrote them for module 5 revision, so mostly Algebra and shape questions. Two revision activities for Higher GCSE students (designed for students working at Grades 6 - 8). Students work through the questions on the sheet to revise facts and procedures for a range of topics. This is very ‘print budget friendly’, with a single side of A4 providing enough questions to fill a whole lesson (expect it to take around 45 minutes). There are two versions: calculator and non-calculator. 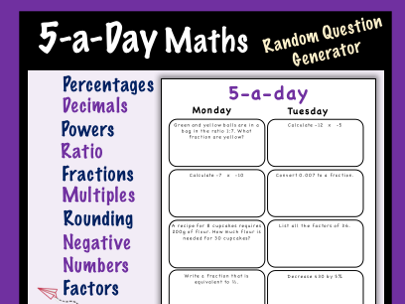 The non-calculator version was written by @Adam_SmithMaths and tweaked by me. I wrote the calculator version. I wrote this having been inspired by a twilight INSET at my school promoting the benefits of low stakes quizzes and knowledge organisers. This is how i used it with my year 9 foundation group. At the beginning of the unit i gave everyone an A4 colour copy of the knowledge organsier. Every lesson i referred to this page and talked through the previous lesson and,also, where we are going in todays journey. After i had introduced all topics, we spent the next few lessons working through the mini-tests to ensure as much fluency as i could muster! Having used them, i think the biggest drawback was that students were reliant on this sheet and i should have demanded students spend time re-producing the important elements of this knowledge organiser so they could recall the information for themselves. I also felt that the questions became progressively more difficult and this thwarted fluency a little, especially for my weaker students. 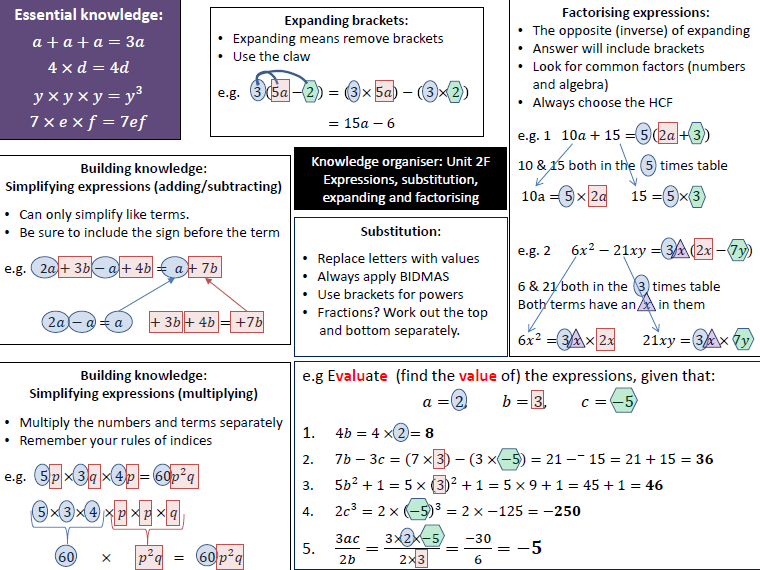 One A4 page Knowledge Organiser including Need-to-Know facts, Keywords, Exam Question, MathsWatch clip numbers, Worksheet links and Curriculum Flowchart. Aimed at KS4 students. Especially for schools who are using a knowledge based curriculum. 12 separate worksheets which focus on the lower end of the higher specification. Sheets are best used when photocopied up to A3. Topics are revised through a selection of created questions, and past exam questions. Appropriate for Year 10 and 11 Set 2 and 3. Jeopardy designed as a revision aid for Edexcel unit 2 foundation exam covering key topics. Fraction Bingo! Revision or introduction game. This resource comes with ten different fraction bingo cards and a set of rules and tips. This game can be used to revise/practice fraction reduction, fraction addition and subtraction, fraction multiplication or fraction devision. 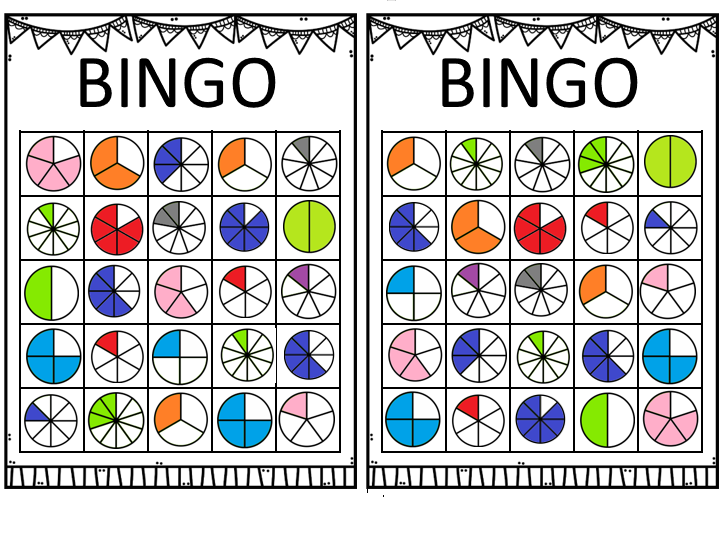 The fractions on the bingo card are visually represented and all in lowest terms. This is a great resource for any age! Please use a great revision resource for group work. Please also leave any feedback for future revision mats and how to improve them.